The Birds of Knowledge sing their songs of wisdom within the heart of the Tree of Life, whose branches whisper their gentle poetry with the wind. Roots grow deep into the ground, drawing the sweet music of life up into our hearts. Interlacing branches reach high into the heavens. They carry the prayers of the earth: the Song of the Trees. 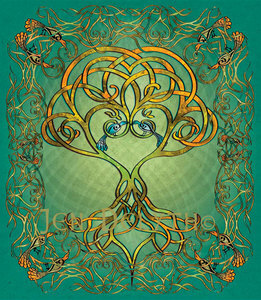 The interlacing roots and branches symbolize the Celtic belief in the Continuity of Life.